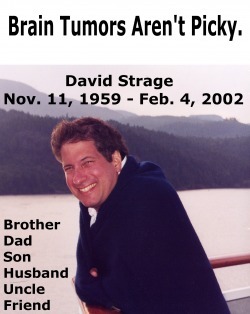 My brother, David for whom this tournament is named, died at the age of 42 from an inoperable brain tumor. He did not go "quietly into the night" but fought with every breathe he had to have just one more day with his wife and three daughters. After a 6 year battle, he lost the fight. He is lovingly remembered through this annual event. Last year, the David Strage Memorial Super Series Event surpassed our goal of raising $42,000 for Brain Tumor Patients & Research. This year, while we take a break from formal fundraising, we will not take a break from educating people about Brain Tumors. They attack with little or no warning and without regard for age, gender or race. They are most often lethal and leave a trail of wreckage in it's wake. $44,205 for Brain tumor Patients and Research! Thank You for your support over the past decade! Three Time Winner, Jan Abaza and her brother. Jan is now playing on the WTA tour - but we saw her first!